Just another day using the Windows 10 and I am back with a post to fix another Windows 10 error. The latest update to the Windows 10 added few handy features and but some users have reported about the error WMVCore.dll is Missing whenever they try to open a program on their Windows 10 PC. If you have upgraded to the Windows 10 Enterprise N edition, this error can be a common problem. The error can occur for any programs including programs like Camtasia and Adobe Premier Pro. If you are on Windows 10, you can fix the WMVCore.dll is Missing error by following the first two methods. If you are on older version such as Windows 8.1 or Windows 7, try the other fixes given in addition to the two fixes. Causes of WMVCore.dll is Missing Error? The error “The program can’t start because the Wmvcore.dll is missing from your computer. Try reinstalling the program to fix the problem” is self-explanatory as you can see the error is caused because of a missing dll file and in this case, the Windows cannot find the WMVCcore.dll file to run the programs. In most of the cases, the error can be used by installing the Windows Media Player. However, there are other ways to fix the WMVcore.dll is missing error. 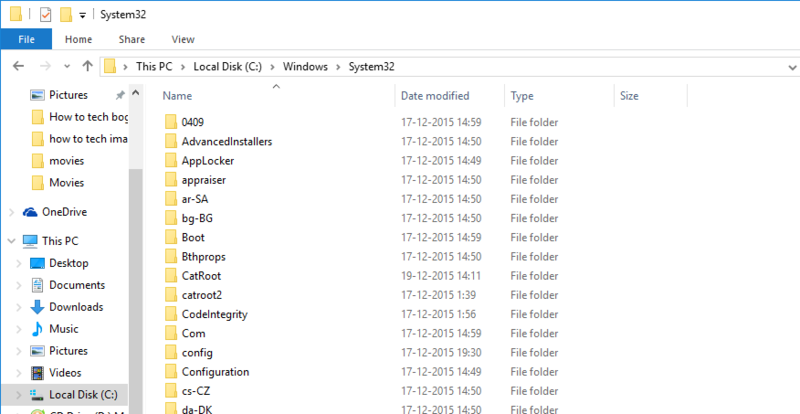 The WMVcore.dll file is already stored on your Windows 10 PC’s System32 folder (Window.old). All you have to do is copy the WMCcore.dll file from the System32 folder to the program installation folder (Sysytem32 Folder) which is giving the error WMVCore.dll is Missing in Windows 10. Follow these steps to know how to do it. Open the Windows File Explorer by pressing Windows Key + E or by clicking on the File Explorer icon on the taskbar. Alternatively, click Start and click File Explorer. Navigate to Local C:/ if you are not already in it. Click and open the Windows.Old folder. Double click to open the Windows folder and then open the System32 folder. Type WMVCORE.DLL in the explorer search bar at the top right corner and search for it. In the search result, you should see a WMVCORE.DLL file. Right-click on the WMVCORE.DLL file and select Copy. Now go back to Local C:/ and navigate to Windows > System32. Open the System32 folder and paste the copied WMVCORE.DLL file. Once you have copied the WMVCORE.DLL file successfully to the System32 folder, open the program that was giving the WMVCORE.DLL missing error in Windows 10. The program should start without any errors. If you cannot locate the WMVCORE.DLL file in the System32 folder as mentioned in the first method, then you can fix the WMVCORE.DLL missing error in Windows 10 by downloading and installing the Windows Media Player. If you are running the N and KN version of Windows 10, then you can download the Windows Media Feature Pack from here. If you have tried the above methods and were unable to fix the WMVCore.dll is Missing Error then you can try the below-given fixes. These fixes are tried and tested on Windows 8.1 and lower version running Windows versions. Types of WMVCore.dll is Missing Errors? Restore the File from the Recycle Bin – Since the very obvious cause of getting a WMVcore.dll file missing error is because the WMVcore.dll is missing from your PC. At times, you may delete the WMVcore.dll file accidentally. So if you have mistakenly deleted the WMCcore.dll file, you can find it in the Recycle bin. Go to recycle bin, see if you can locate the missing .dll file and restore it. Use Antivirus Software – The WMVcore.dll error can also occur if a virus has infected your program or corrupted the file. In such cases, even reinstalling a software wouldn’t work. So, run the Antivirus tool and see if you can detect any malicious code. System Restore Point – You can alway restore your System to an earlier point if you had installed a new software. So, if you are facing an error after installing a new software or after tweaking with your System, try to restore your system to the point where had everything working fine. You can find the System Restore point settings by searching System Restore. Reinstall the Program – If nothing seems working, you may want to reinstall the program that is giving the error. So, uninstall the program completely and get the latest version of the software. If you are getting this error after updating to the latest version, then roll back to the older version of the program.